An open-graded friction course (OGFC) is a special type surface layer of traditional Dense Graded Hot Mix Asphalts (DGHMA) pavement that is increasingly being used around the world due to its various benefits, such as, frictional, safety and environmental, etc. In this research, selective laboratory OGFC properties were statistically modeled depends on mix design inputs for two purposes or aims; mix inputs significant and prediction the OGFC properties according mix inputs. Principally, Indirect Tensile Strength (ITS), water sensitivity (TSR), and permeability (K) were selected from mechanical, durability, and volumetric properties, respectively as an output property; they represent the dependent variables for each model. While, fillers as conventional mineral filler or Ordinary Portland Cement (CMF, or OPC), binder content (BC), and polymer content (SBS) are represented inputs or the independent variables for all models. The generated models offered a vital achievable tool for prediction (e.g., their R² are 0.781, 0.82 1and 0.820, respectively, for the mentioned model’s properties), also it helped to scale the significant of each independent variable (e.g., filler type significantly affect water sensitivity properties, its correlation was 0.752). This study reveals that the statistical modeling is achievable and offers a dynamic tool to describe the characteristics and performance of OGFC mixture in term volumetric, mechanical and durability properties. 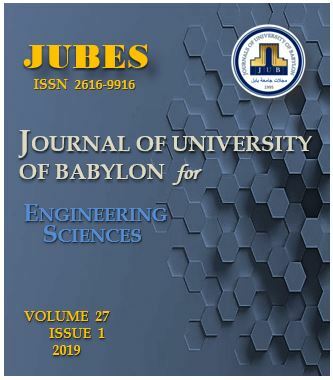 O. Al-Jawad and S. Al-Busaltan, “Statistical Modeling for the Characteristics of Open Graded Friction Course Asphalt”, JUBES, vol. 27, no. 1, pp. 366 - 381, Feb. 2019.